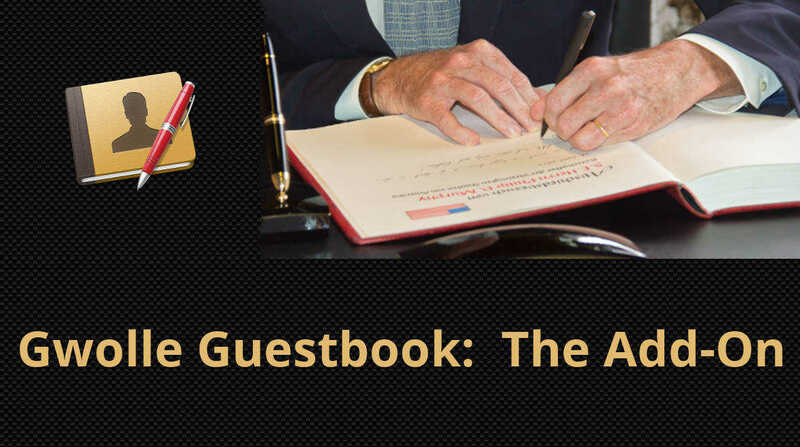 Gwolle Guestbook: The Add-On is the add-on for Gwolle Guestbook that gives extra functionality for your guestbook. Meta Fields, Star Ratings, Social Sharing, Easy String Replacement and much more. Gwolle Guestbook is the no.1 guestbook plugin with 40.000+ active installs. This add-on extends its features. * Meta Fields. Add any field you want; company, phone number, you name it. * Social Media Sharing (optional). * Star Ratings, with voting and display and Rich Snippets for SEO (optional). * Average star rating per guestbook, including a widget. * Preview for the frontend form. * Preview for the admin editor form. * Admin reply on the frontend with AJAX. * Easy String Replacement in the default text so you can make this guestbook into a review section or anything you want. * Delete button in each entry for the moderator and author (optional). * Permalink button in each entry for easy access (optional). * Email button to contact each author (optional). * Sitemap support for popular SEO/Sitemap plugins. * Auto Anonymize timer (optional). * Auto Delete timer (optional). 1. At MOJO Marketplace, browse to My Account > Plugins. 2. Select Gwolle GB: The Add-On. 3. At the Download section, click on the download for Child Theme. 4. Now you are downloading the zipfile with the plugin. 1. Go to Dashboard > Plugins, then click on "New Plugin", then click on "Upload Plugin". 2. Select gwolle-gb-addon-1.3.2.zip to upload (or any newer version you bought). 4. Go to Dashboard > Guestbook > The Add-On and select the options you want. There are different options to update to a new version of the Add-On. a. Use the One-click installer from Mojo Marketplace. b. Deactivate and remove the add-on. Then follow to Installation instructions for the new version. No settings will get lost. c. Unzip the plugin zipfile, and upload it with FTP to your /wp-content/plugins folder. You can use a program like Filezilla for this. => Will users get tracked if the Social Media sharing is enabled? No, the sharing icons use links to the sharing pages, not the icons that get loaded from those Social Media companies. Only when people do share, do they get tracked. => Which SEO/Sitemap plugins are supported? * All In One SEO Pack. => Which PHP versions is this plugin compatible with? This plugin is compatible with PHP 5.3 and newer.